Pure chocolate amazingness right here. So festive and so addictive! 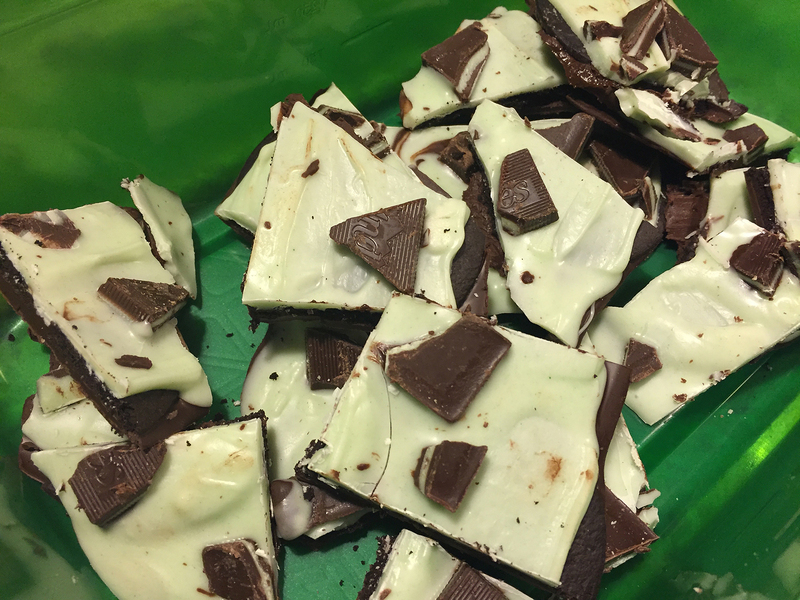 For the past several years now I’ve been concocting different versions of chocolate bark for the holiday season. For 2015, it’s a tasty rendition on dark chocolate and mint—that is super simple to make. The surprise ingredient is incorporating Famous chocolate cookie wafers sandwiched between the two layers of luscious white and dark chocolate. 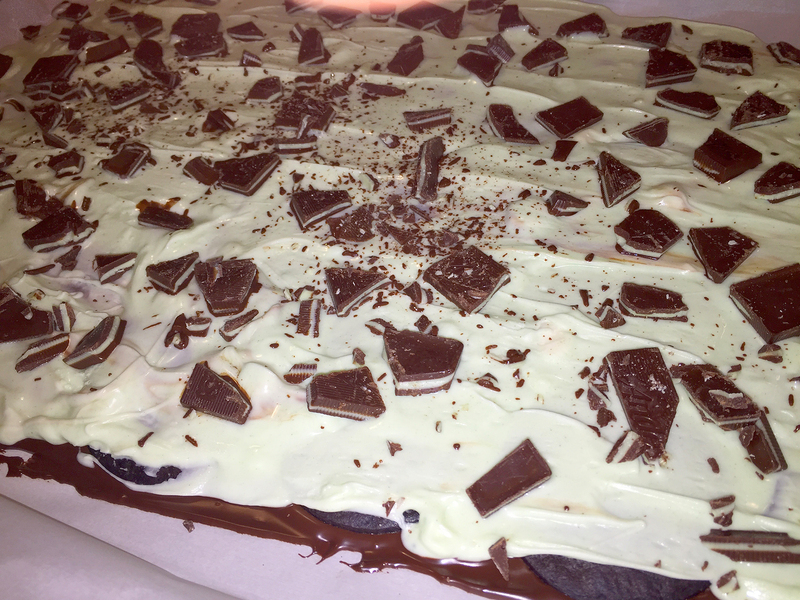 And for the grand finale, topped with chopped Andes Creme De Menthe Thins. Layering on chocolate cookie wafers on the melted dark chocolate. Spreading on the tinted white chocolate over the refrigerated chocolate layers. The hardened candy before it is cut into chunks. 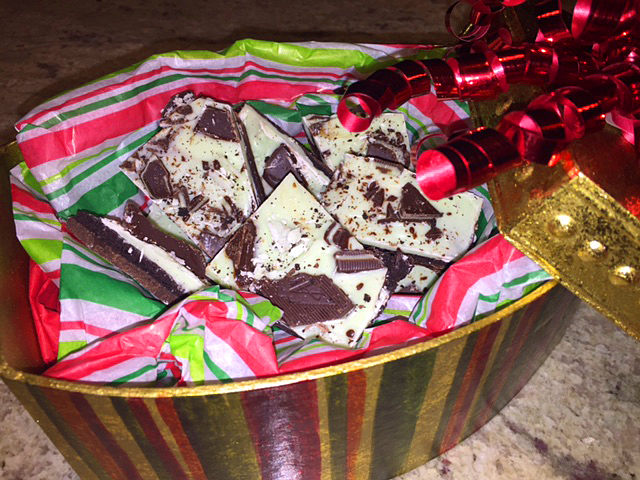 Coarsely chop Andes mint candy and set aside. Place dark chocolate in a heat proof bowl (or double boiler) over (not on) simmering water and stir until melted. 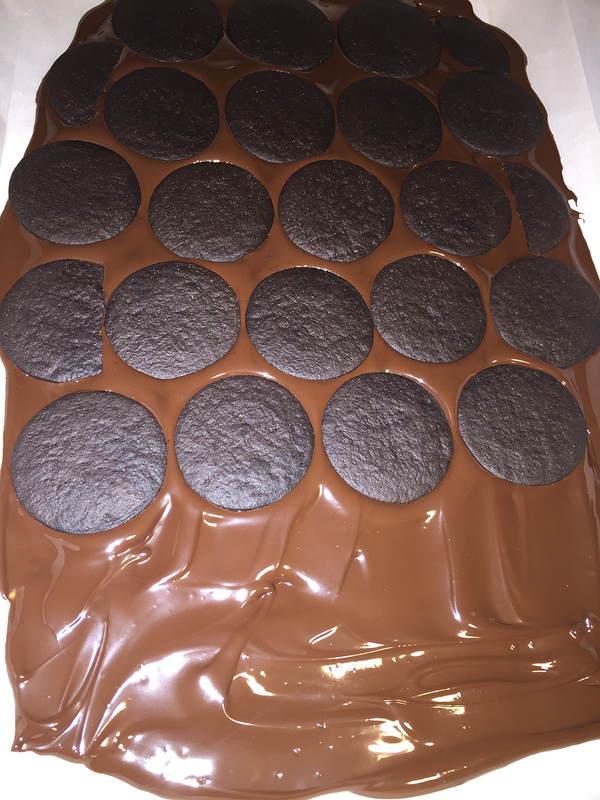 Pour melted chocolate onto a large rimmed baking sheet covered in parchment paper. Using an offset spatula smooth out chocolate until you achieve an even layer. Don’t worry about perfect edges. Clean out the bowl/pan to later melt the white chocolate. 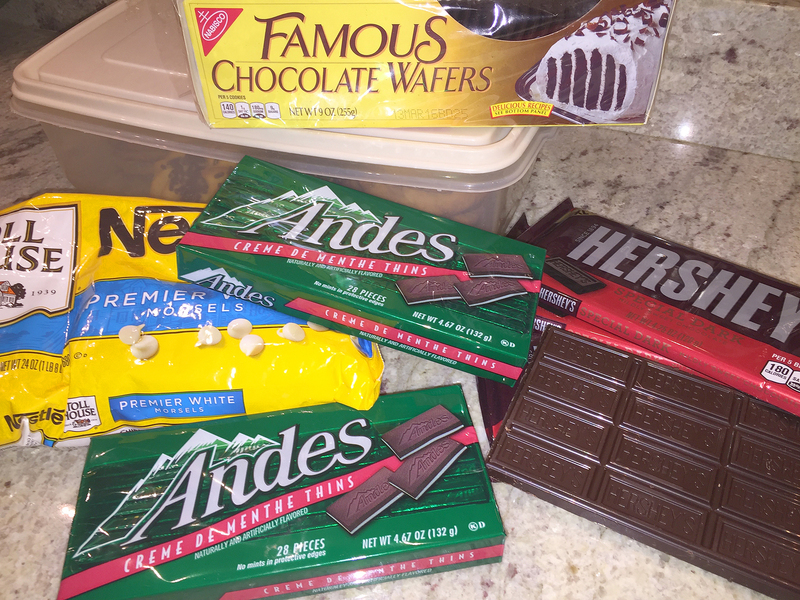 Press chocolate cookie wafers lightly into melted chocolate; and place pan into the refrigerate for 10 minutes to slightly harden the candy. Place white chocolate pieces into the now clean bowl over (not on) simmering water and stir until melted. Remove from heat. Add a tiny amount of green food coloring to tint the white chocolate and stir until thoroughly combined and even in color. Add a drop or two of mint extract; stir to combine. 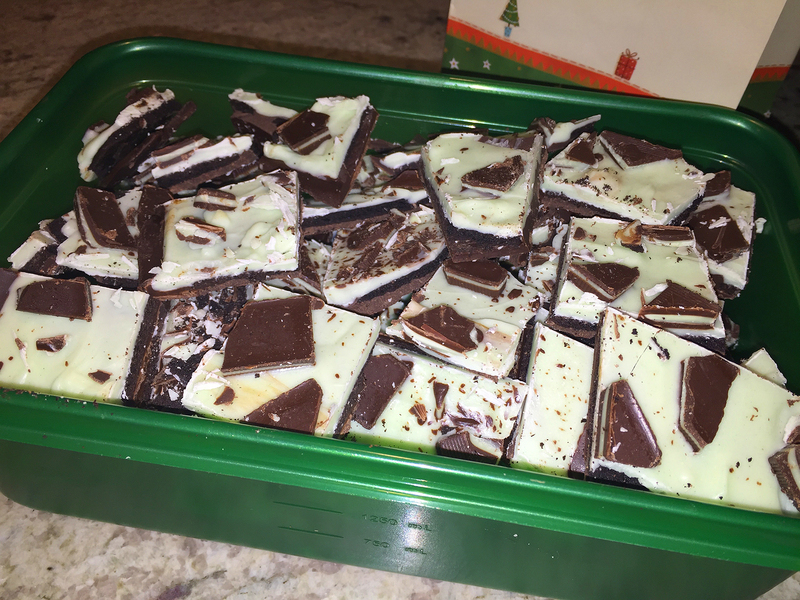 From the refrigerator remove pan with dark chocolate and wafers and pour tinted white chocolate on top. 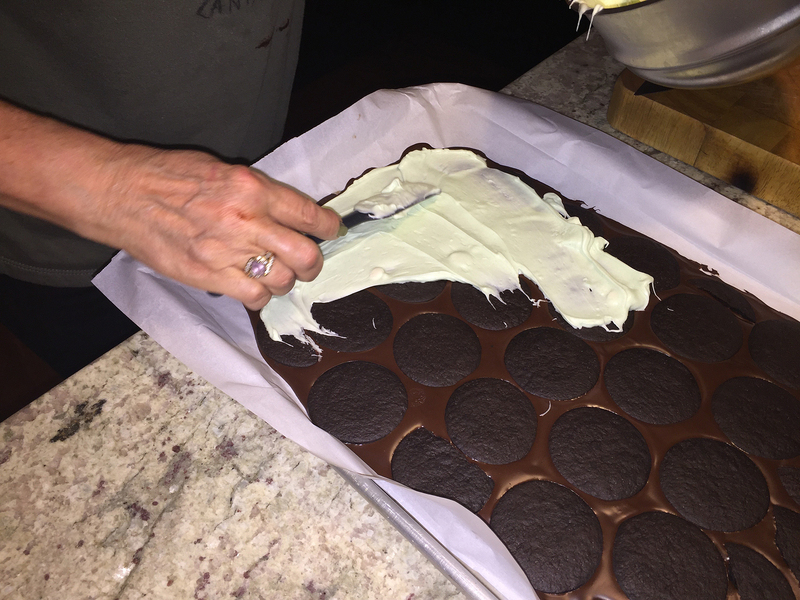 Smooth out using an offset icing spatula until you completely cover the bottom layers. Sprinkle chopped Andes candies on top. Return the fully assembled bark to the refrigerator for at least 30 minutes to harden completely. Cut into irregular shapes with a sharp chef’s knife. Store in the refrigerator in a tightly sealed container. Boxed up and ready for any occasion.